Do you ever wonder what the condition of your flue is? It’s one of the most important parts of your commercial kitchen, though many people don’t even think about their flues at all. Out of sight, out of mind, right? Well, it’s actually really important that your flue stays as clean as possible. If it gets too dirty, grease can build up to dangerous levels in there, resulting in a flash fire. That would not only be dangerous for your kitchen staff and patrons, it would also be costly. 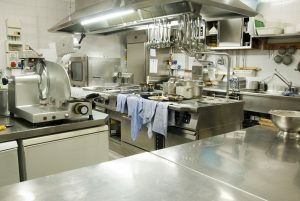 You’d have to stop operations to repair your commercial kitchen and make sure it’s safe for cooking again. Plus you could get serious fines for operating a commercial kitchen with a dirty flue. Avoid all this by partnering with Flue Steam. When you establish a partnership with Flue Steam, you won’t have to worry about the cleanliness of your flue ever again. We’ll take care of it! We offer complete hand-scraping and steam-cleaning services. You’ll be able to rest assured that not only is your flue clean and your risk of flash fires dramatically reduced, but you’ll always be up to code. We even provide stickers every time we come to clean your flue so inspectors will always be satisfied that your flue meets code requirements. Our services improve safety, air quality, and energy efficiency in your commercial kitchen. Discover why so many other commercial kitchen managers rely on our impeccable flue cleaning services today. In addition, we can also check belts, grease bearings, and replacing parts at every regularly scheduled flue cleaning service. You’ll have so much peace of mind when you partner with Flue Steam! Ready to learn more about Flue Steam? Find out more about how much you can gain by partnering with Flue Steam by calling 800-700-FLUE today. We’ll be happy to discuss our services with you and provide you with personalized recommendations. Permanently ake flue cleaning and various other essential commercial kitchen maintenance tasks off your and your staff’s busy schedules by partnering with Flue Steam today.